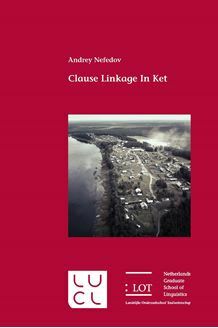 This work provides a typologically oriented description of clause linkage strategies in Ket, a highly endangered language spoken in Central Siberia. It is now the only surviving member of the Yeniseian language family with the last remaining speakers residing in the north of Russia’s Krasnoyarsk province. Although Ket can be said to have a rather long history of studies, there are issues that still lack a comprehensive and coherent account in the existing literature on the language, issues of clause linkage being one of them. The present study seeks to change the situation by providing a unified description of strategies used to code various clause-linking relations, including coordinative relations, complement relations, adverbial relations and relative relations. The theoretical background of the present study is based on the general framework developed within the functional-typological approach. It incorporates all the advances made during the last decades with respect to Ketology and the study of clause linkage typology to ensure its descriptive and typological value.